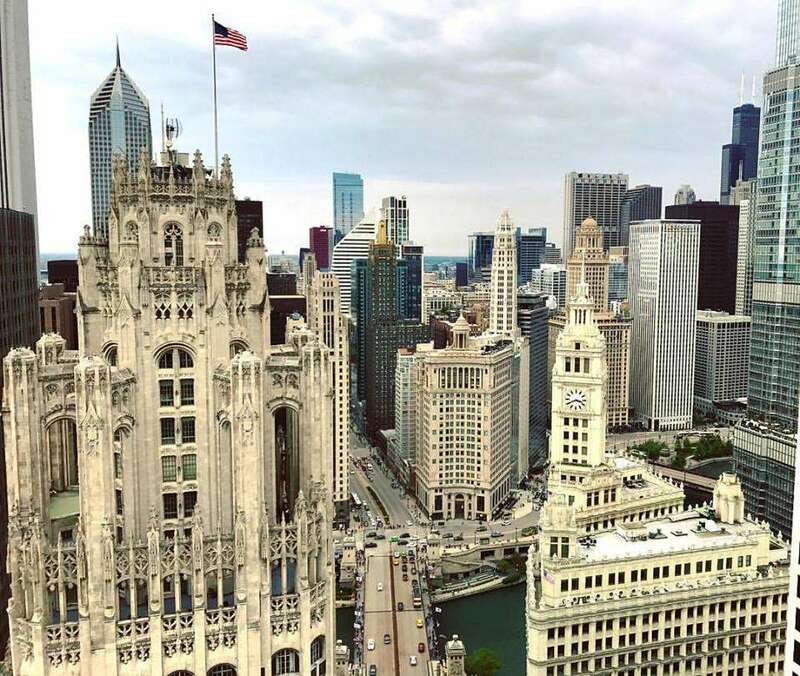 With two professional baseball teams—Chicago Cubs and Chicago White Sox—plus football, hoops, hockey and soccer squads, there’s no doubt Chicago’s one heck of a sports town. That’s why you’ll spot a sports bar on just about every other corner in most neighborhoods. In some areas, like Lakeview, Lincoln Park, and River North, the number of sports bars rivals Starbucks as far as how many you’ll find. So, how do you decide when you’re in need of a great spot to catch the action? We’ve gathered our favorite sports bars in Chicago. The Globe Pub, located on the north side of Chicago, has over 400 choice beers available; a huge pub-food menu, with favorites like bangers, fish and chips, Irish stew and black pudding; and international and national sporting games can be viewed on the screens throughout the place. This pub is the place to be to celebrate your team, even if that team is far across the pond. ​1934 W. Irving Park Rd. Located on the seventh floor of Water Tower Place, the 23,000-square-foot entertainment complex offers guests dining, sports viewing, private-events space and a retail store. It is also home to the city's first-ever Chicago Sports Museum. The Chicago Sports Museum is comprised of 8,000 square feet and offers an interactive, high-tech experience, unique sports memorabilia (think Sammy Sosa’s corked bat), and an impressive collection of local sports artifacts. The Hall of Legends gallery highlights an array of “play with the legends” baseball, basketball, football and hockey interactive games, such as "defending the goal" with Blackhawks star Patrick Kane. There are also three private events spaces. The bi-level cocktail lounge and eatery showcases retro and contemporary arcade games in a swanky setting. The menu falls in line, featuring familiar dishes and drinks inspired by 1980s and 1990s pop culture. When no important matches are on the tube, you’re certain to fight through the crowds to get to the old- and new-school arcade offerings. Each game is only 25 cents. On tap: quirky signature cocktails with familiar arcade game names and a host of craft beers on draft and in the can. 213 W. Institute St., 312-291-8735. There is a second location in Lakeview. A good mix of the Gold Coast’s young professionals, residents and visitors come to Luxbar to chill out and get away from the pretentious crowds found at some of the area’s other establishments. Rows of televisions can be found above the bar in the main dining room as well as spread throughout the room. Bartenders pour fast and hard. The original Ditka's location is based in Chicago and around the corner from Water Tower Place. The former head coach of the 1985 Super Bowl Champions--the Chicago Bears--is behind this upscale sports bar with premium steaks, chops, and burgers on the menu. The highlight of the bar menu, which is a signature of the house, is the Coach's pot roast nachos topped with cheddar-jack, jalapeños, sour cream and fresh tomatoes. Also great are the cowboy oyster shooters, filet mignon sliders, and crispy tuna avocado roll. The Bronzeville-based restaurant showcases a small sports bar in the rear where you can order from the full menu. That includes Caribbean- and New Orleans-inspired dishes (shrimp, chicken and lobster gumbo; roasted Cajun catfish plate) and drinks. One very large screen and two smaller ones are available for viewing games. The restaurant is closed on Mondays and Tuesdays, so no Monday Night Football. These guys excel at pub grub, yet they remain under the radar for it. The same team behind Prime & Provisions have perfected at the sports-bar theme, and Public House is spacious with larger screens than the average tavern. What also sets Public House apart from its competitors is that it features DIY taps at certain tables, so patrons can pour their own spirits and beer. Those who frequent the South Loop swear by this towering sports lounge situated on a busy corner. Not only does it boast more than 30 televisions to watch big games, but also its signature foot-long grilled cheese. Don't forget to bring friends! Since the mid 80's, Sluggers has been the neighborhood hot spot, especially before or after a Chicago Cubs game. Today you can sing along with the interactive dueling pianos, hit a ball in the batting cages, play some arcade games and nosh on a slice of deep dish Chicago-style pizza. Of course, there are large-screen televisions everywhere you look so you'll never miss a score.